Robert 'Wolfman' BelfourRobert �Wolfman� Belfour was born in 1940 in a small plank house on the Hurdle Farm several miles south of Holly Springs. Sharing both territory and its musical heritage with a number of accomplished performers - including RL Burnside, Fred McDowell, Joe Callicott, Jesse Mae Hemphill and Junior Kimbrough - Robert ate at Othar Turner�s goat roasts and sang gospel songs led in church by Sid Hemphill. Robert�s first memory is that of his father playing a resonator guitar in a style similar to Charlie Patton�s, a guitar he later spent much of his free time learning to fret. He was thirteen when his father died, ending his childhood, and from then on all of Robert�s energy went into helping his mother provide for him and his younger brother. In 1959 he married Noreen Norman and they moved to Memphis, Tennessee. A year later Robert went to work for Choctaw Construction, a brutal gig that lasted thirty-five years. He kept playing in his spare time for family and friends and earned his �Wolfman� moniker for his penchant for �Howling Wolf� numbers. Robert started playing on Beale Street in the early 80�s at the suggestion of his wife. He was recorded by musicologist David Evans in 1994 for the German-based Hot Fox label, playing eight songs on a 20-song compilation, �The Spirit Lives On; Deep South Country Blues and Spiritual�. As good as these tracks were there was nothing to prepare the blues world for the 2000 album �What�s Wrong With You� released on Fat Possum Records. Over forty years of guitar playing is clearly heard throughout this record, as he bares his soul of all the heartbreak and hard times in his life. 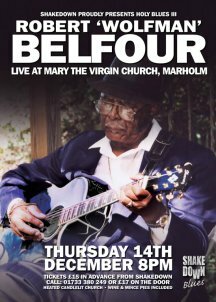 And through his vintage of country-based blues that looks back into the 20�s and 30�s, you can tell that there�s not a fake bone in Belfour�s body. This was followed in 2003 by the equally good Fat Possum release �Pushin My Luck�. Robert has perfected a mature and highly accomplished guitar style, his voice is clear and powerful and the sound is pure hill-country blues. Robert might have left the hills of north Mississippi over 50 years ago but his music never did. Mainly taken from Matthew Johnson�s book �Darker Blues� published by Fat Possum.